Today we will implement a circle packing algorithm using Processing. The inspiration for this tutorial came from this YouTube video, where Grasshopper was used. Also this time I have to thank Entagma for giving useful hints on how to achieve the result. We are calling this controlled circle packing as opposed to random circle packing (here an example of the latter), where we randomly try to fit new circles inside the space left. In our case the circles will try to find by themselves their optimal/sub-optimal position by moving inside the given space. If a circle is not overlapping with any other circle, zero its velocity, hence stop its motion. Also in this case, my starting point was the flocking algorithm written by Daniel Shiffman in the way they we revisited it on our Differential line growth with Processing tutorial. Hi, thank you! I think that this code could be a good starting point but you’ll have to do some tweaking. An idea is to add the separation force for every particle proportionally to their distance and sizes, plus the separation force from the big circle. At a certain point the system should reach some sort of equilibrium. Let me know how it goes. Hey, thanks for your quick answer. For now I’m just trying to port it to Python. 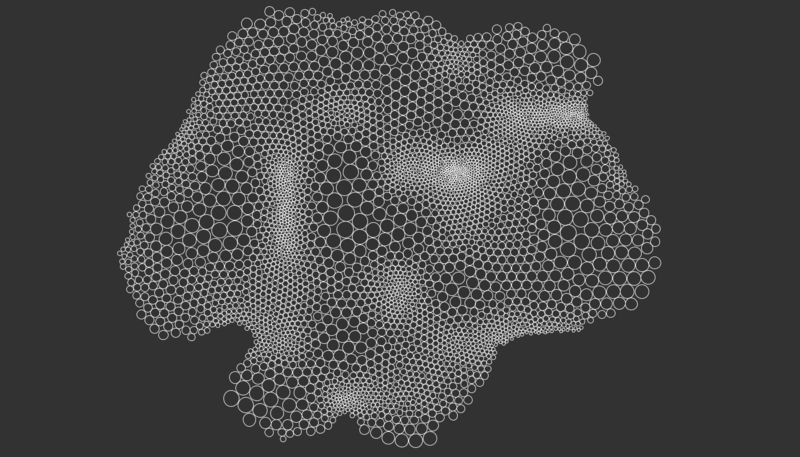 I opened a question on Stack Overflow: https://stackoverflow.com/questions/49494451/controlled-circle-packing-with-python. The porting/modification of your code is done. Now I can pack circles in a big circle 🙂 (check the question on SO). Now I’ll start doing what I initially wanted to do.